Army Staff Sergeant Robert J. Chiomento, of Fort Dix, New Jersey was assigned to the 2nd Battalion, 4th Infantry Regiment, 4th Brigade Combat Team, 10th Mountain Division, Fort Polk, Louisiana. On July 17, 2006, in Khwaya Ahmad, Afghanistan, his patrol came under attack from enemy rocket-propelled grenades. 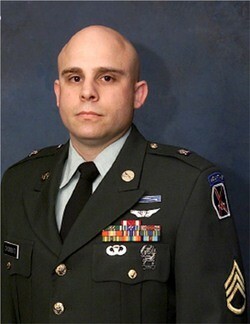 He was serving in Operation Enduring Freedom when he was killed at the age of 34. The son of an Army Staff Sergeant, SSG Chiomento knew as a kid that he wanted to join the military. In October of 1991, the same year his father retired, he did just that. His first post was in Fort Wainwright, Alaska. He ended up meeting his wife there, as she too was in the Army. His awards include the Bronze Star, Purple Heart, Combat Infantry Badge and an Army Achievement Medal. SSG Chiomento had plans to finish his bachelor’s degree once he was done with his service in the military to show his children the importance of education. "I would trade a million anythings for him to be back here, but I'm proud of what he did, and his children will grow up knowing what he did, and they'll be proud of him, too," said his wife. "He was proud to be a soldier, a father, a husband, and an American." SSG Chiomento is survived by his wife and two daughters, the youngest of which is a Folds of Honor Children’s Fund Scholarship recipient.